A rodent problem in your home can be unsanitary and even dangerous in some situations. However, it is not always easy to be certain that you have mice or rats sharing your living space until they have had enough time to breed. Fortunately, you can stop the infestation from becoming huge by paying close attention to several signs that something is amiss. 1. Damage to Food Packages – Did you buy a bag or box of cereal or pasta a few days ago that was in perfect condition but now has unexplained holes in the packaging? If so, you have most likely provided a meal for at least one rodent that has decided to become your unwelcome roommate. 2. Droppings and Urine Pools – Rodents tend to leave a lot of feces and urine throughout the house that they invade, especially in areas where they are able to find food and shelter. Additionally, you will most likely find their waste in attics, garages, drawers or cupboards and along your walls. 3. Squeaking Noises – Another easy way to tell if rodents have moved into your house is to listen for the scampering, rustling and squeaking noises that accompany their movements. Keep in mind that rodents display nocturnal like activity, so you are more likely to hear these noises at night or early mornings. 4. Bite Marks – Biting and gnawing is a natural aspect of life as a rodent, and they love to chew on many items including wood and electrical wires. This can become dangerous and very destructive, and is one of the many reasons that a rodent infestation must be dealt with immediately. Failure to take action could result in extensive damage as well as an electrical fire that could destroy your home. 5. Unusual Pet Behavior – Cats and dogs will pick up on the presence of a rodent much earlier than most humans, and tend to act very excited near the unwelcome visitor’s hiding spot. In other words, if your furry companion starts scratching at the walls or cupboards, you should definitely investigate to see if a rodent is nearby. 6. Grease Marks on Your Walls and Cupboards – Mice and rats are able to push their bodies through exceptionally small holes, but they often leave grease marks behind due to the dirt and oil that is on their coat. The larger and more distinct the grease mark is, the more likely you are dealing with a rat instead of a mouse. 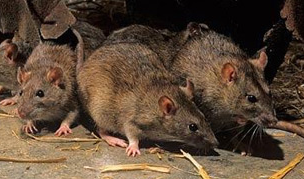 If you have any reason to believe that you have rodents inside of your Sacramento area home, you should contact Barrier Pest Solutions at (916) 683-2929 to schedule a rodent extermination. This is the best way to stop the infestation from becoming extremely serious, and taking this step can also help prevent electrical damage.